Dry Vacuum Pumps can run continuously exclusively with clean, dry air. Unlike other kinds of pumps, the dry rotary vane pumps can run at any pressure. Maintenance is very easy and consists of replacing the vanes and cleaning the filters. The main application fields include: suction cup movements, automatic machines, woodworking machines. 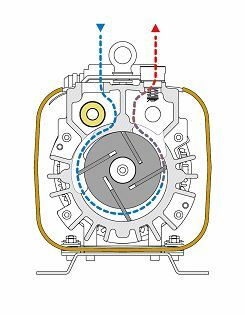 Dry vane vacuum compressors have no particular restrictions on their use, except for the maximum operating pressure which should not exceed the rated value. For this reason it is always recommended to use a safety valve. Upon request it is possible to accessorise the oil free rotary pumps SC.60 140 with a FBX-S noise reduction box.